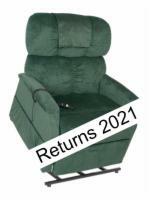 Three-position lift chairs allow a user to recline back to a nearly horizontal position for superior relaxation. 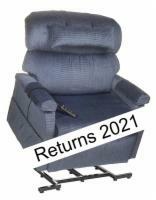 Choose a simple lift recliner without the bells and whistles, or try a fully loaded model with cup holders, built-in trays, and more. Browse our selection of three-position liftchairs using the site map below, or call 1 (800) 797-4654 to consult with our lift chair experts for assistance! 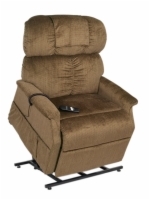 Pride's lowest price 3 position lift chair still makes an impressive bid to win your affection with its sewn pillow back design and integrated battery backup. With an integrated battery backup and easy to use quick release hand control, it is no wonder that the Golden Monarch lift chair is a long time customer favorite. 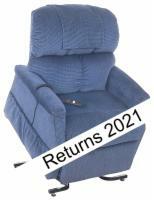 The ultra soft back pillow and seam-back design make this model a customer favorite. Rock solid construction and top quality materials add value and reliability that is unmatched. The top model in Pride's Classic Collection has an integrated battery backup, arm covers, and a split-back design. Comes with integrated battery backup, arm and head covers, and biscuit-back design. Perfect for those on the smaller side, the PR501S lift chair provides the right fit without sacrificing the important features that have made Golden a leader in the industry. Call us now and receive preferred pricing! Top Seller! 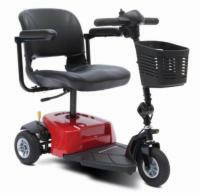 All of the features that you would expect from a 3 position lift chair and more! 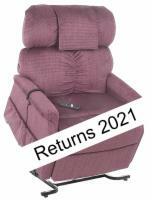 Includes deluxe head and armrest covers, extra soft seat back, and overstuffed microfiber cushions. Petite Fit! The Junior Petite provides the perfect fit without sacrificing comfort. 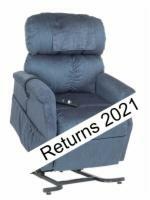 This fully featured 3 position lift chair offers value and durability unmatched by other lift chairs in the same class. The small size of Pride's perennial top seller Heritage Collection is no lightweight when it comes to its sturdy frame, arm and head covers, and battery backup. Pride's best seller! Not only do you get a high quality 3 position lift mechanism, you also get an integrated battery backup, arm and head covers, and a lower price if you call us now! 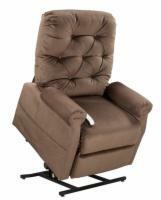 Incorporating a wider seat, this 3 position lift chair is perfect for larger individuals. And don't forget that it comes with a built-in battery backup and arm and head covers. A large chair does not necessarily mean a large price! 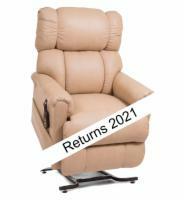 Call one of our lift chair experts and find out how the PR501L can improve your quality of life.